I really didn't get all that much sleep last night but I am feeling much better today. I was just a whiney hot mess last night but today is already better. I must have just been having one of "those" days! 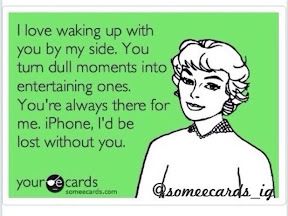 My day started with this Ecard which put a huge smile on my face and it really just stayed the whole day. I went to spin class this morning, EARLY AGAIN, and we still have a sub. Dont tell anyone but I am totally his favorite. Its really not a secret because he said in class I was his fave....ok, so what he said was "We ran that race together" but what I heard was "you're my fave!" He said he saw me at the race on saturday (the rainy one that I finished second to last) and that he was behind me....I knew he was LYING when he said that!!!! Anyway, being the favorite comes with its own subset of problems. I didnt want to disappoint him so I was just spinning my little heart out, but the problem is my "area" is still sooooooo sore from Tuesday's run which made this an incredibly effective but painful spin class. The pain is not exclusive to sitting on a bike seat, every time I stood up from my desk chair and sat back down it felt like I took a punch to the "area!" After spin I did a bit more cardio with elliptical and step and then tried to get to work a touch early since I had quite a bit to do. 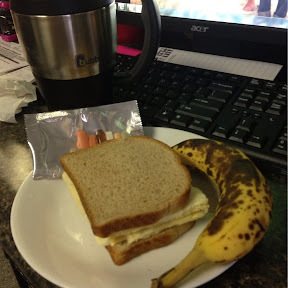 And I was really hungry this morning so the sooner I got to work the sooner I got to eat my breakfast. Work was crazy from start to finish. I was super busy but not so busy that it was not fun...it was a pretty good day at work. After work I got to go home, watch a soccer game and spend time with my family. I have talked to most of them but only actually visited one this week. You know if I don't get my family time I get a little cranky. But tonight I got to see them at the ballgame and then have some dinner together. And the best part of my day, I was home before 9pm, my bags are all packed up, and I will be in bed before 10...and I got to watch a whole TV show! I was almost a normal 20 something year old tonight. I have a new shirt for you guys tomorrow that I think you are really gonna like. Get ready cause its a good one and Im making you wait!! I have a big day planned tomorrow. It starts like normal, Pump and cardio, but then at lunch Im going out to celebrate Sister ? 's birthday and eat some Nothing but Noodles and Bundt cake. Don't worry, I have already counted those calories in my daily count so I can enjoy a normal birthday party with my peeps with no guilt. I could stay here and type all night but I am really focused on this full nights sleep.